The species of the genus Eucalyptus are the most planted for the fiber crop in the world. They are mainly utilized for timber, pulp and paper production. Brazil, helped by the favorable weather conditions, appears as a big producer and exporter of eucalyptus derivates. 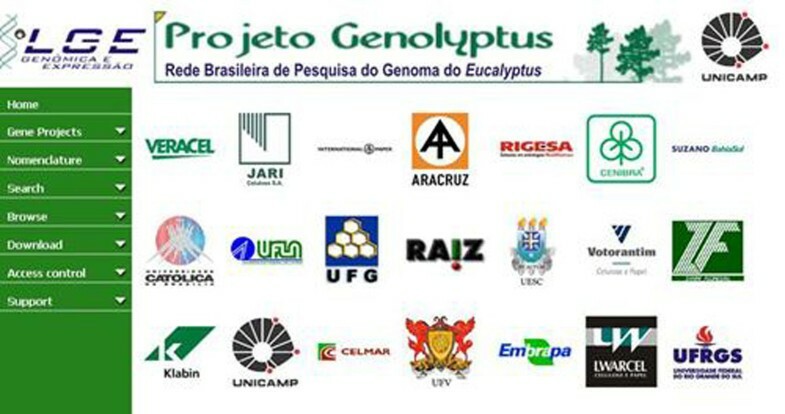 In 2002, the Brazilian network research of the Eucalyptus Genome (Genolyptus) was established with the goal of integrating several academic and private institutions currently working with eucalyptus genomics in Brazil. This project generated around 200.000 ESTs from several tissues and conditions. Consequently, several individual projects have been implemented generating other transcriptome databases, in special, using RNA-Seq technology. In 2010, a draft genome (http://eucalyptusdb.bi.up.ac.za) of the specie E. grandis was produced by researches of the Joint Genome Institute (DOE-JGI) and the Eucalyptus Genome Network (EUCAGEN). The main goal of this work is to develop an Eucalyptusdatabase (http://www.lge.ibi.unicamp.br/genolyptus) integrating public and private data in a friendly and secure web interface with bioinformatics tools that allowing the users perform complex searches. First, the public and private ESTs (130,290 from Genolyptus and 36,981 from NCBI) were assembled producing 48,760 unigenes (17,795 contigs and 30,765 singlets). Basically, the bdtrimmer  and CAP3  programs were used to perform sequence trimming (exclude vector, ribosomal, low quality and too short reads) and sequence assembly, respectively. The autofact pipeline  was used to perform an automatic annotation of the assembled unigenes based on BLAST  searches, e-value cutoff of 1e-5, against some protein databases, including: non-redundant (NR) database of NCBI, uniref90 and uniref100 – databases containing only curated proteins , pfam – database of proteins families , kegg – database of metabolic pathways  and Gene Ontology (GO) – database of functional annotation . The Genomic and Expression Laboratory at State University of Campinas (http://www.lge.ibi.unicamp.br) sequenced ten RNA-Seq libraries from four species (E. Urograndis, E. globulus, E. grandis and E. urophylla) using the Illumina/Solexa technology. Additionally, three RNA-seq libraries  were downloaded from NCBI (SRA – sequence read archive). All RNA-seq reads were aligned against the assembled unigenes and genome assembly using the SOAP2  and TopHat  aligners, configured to allow up two mismatches, discard sequences with “N”s and return all optimal alignments. In order to perform a differential expression analysis between ESTs or RNA-seq libraries some normalization pipelines and statistical tests have been implemented.From ESTs, the differentially expressed genes between libraries were performed applying AC test  in assembled unigenes. The results are available to the users by a web interface (called Electronic Northern) that allows searches by gene or library name. Furthermore, it is possible to compare the gene expression between two or more libraries. From the RNA-seq libraries, the DEG-seq software  was used to perform normalization and statistical analysis considering 99% of confidence rate (cut-off of 0.01). To integrate all data described above, we developed a web site (Fig. 1) hosted in a Fedora Linux machine with MySQL database server. The web interface is based on a combination of CGI scripts using PERL language (including BioPerl module) and the Apache Web Server. The site contains many bioinformatics tools allowing the user perform keyword or local BLAST search in assembled unigenes. Also it is possible to connect these results with gene expression analysis. Moreover, the Gbrowse software (Generic Genome Browser) (Fig. 2) was used to visualization the data in a genomic context, integrating the different information by clickable tracks. The top track is the reference genome assembly and the other tracks correspond to assembled unigenes and RNA-seq data mapped into reference. Home-page of the Eucalyptus database, hosted at http://www.lge.ibi.unicamp.br/genolyptus. Gbrowse interface of the Eucalyptus database. 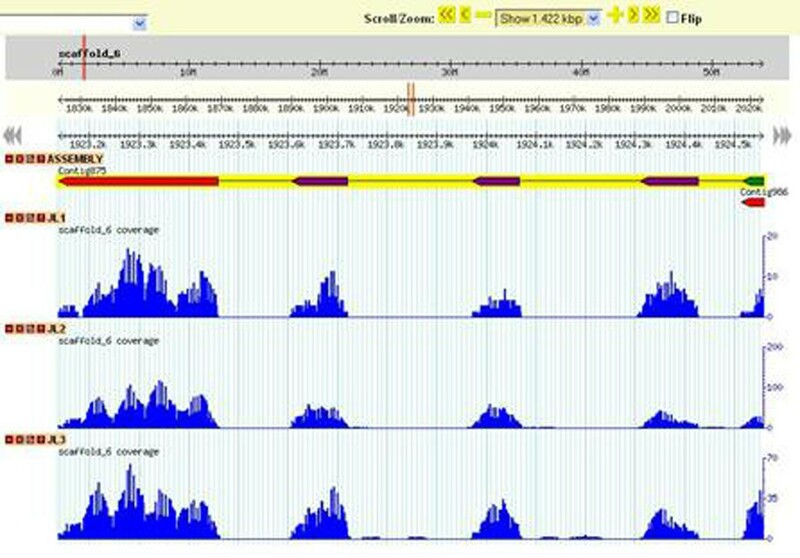 Using Gbrowse is possible to compare gene expression between the RNA-Seq libraries. The authors would like to acknowledge all researches of the Joint Genome Institute (DOE-JGI) and the Eucalyptus Genome Network (EUCAGEN), responsible to produce the draft genome of the E. grandis. Moreover, we thank the CNPQ (Conselho Nacional de Desenvolvimento Científico e Tecnológico - Brazil) for the financial support of this work.